Are the rates quoted comprehensive? Are there any hidden costs I should know about before reserving a car? There are no hidden charges !! The car hire rates do include comprehensive insurance and V.A.T. How is a day detemined for the purposes of invoicing? A day constitutes 24 hour periods or part thereof, from the time of receipt of the vehicle to the time of its return, with 2 hours latitude permitted on the return date. Is travel into neighboring countries permitted and what conditions and rates apply? Travel to certain neighboring countries is permitted at an additional border crossing administration charge and requires written authorisation and documentation. See Terms and Conditions. In what areas may vehicles be collected and returned? 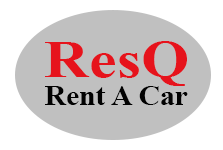 ResQ Rent A Car has only a single base, located in Meyersdal, Alberton – for directions, see map on the Contact Us page. Vehicles may be collected and/or returned at the office, or with prior arrangement, within a radius of 150 Kilometres from its home base, which includes the entire Gauteng Province and neighboring areas of surrounding provinces.